The Central Bank of Yemen’s (CBY) decision this August to float the rial, while helpful in reducing currency arbitrage, is optimal for neither currency stability nor humanitarian aid purposes. Given the central bank’s current weakness, the thinness of the country’s exchange market and the potential for volatility on a day-to-day basis when large transactions occur, fully floating the rial risks its rapid devaluation – a critical issue in a country that imports the vast majority of its basic nutritional needs. The Sana’a Center recommends a dedicated exchange rate for humanitarian funds calculated using a moving average of the market rate of the previous three months. Given the size of foreign aid funds entering Yemen, the use of such an exchange rate would help stabilize the domestic currency and the price of imports on the local market, as well as provide humanitarian organizations with a fair price for their foreign currency and curtail excessive arbitrage. Furthermore, the Sana’a Center recommends increased coordination between the CBY and local banks to ensure that the foreign currency entering Yemen is used to support the importation of essential goods. The international response to the humanitarian crisis – led by UN agencies and international non-governmental organizations (INGOs) – has been hampered by many factors. The belligerent parties have regularly impeded humanitarian staff and supplies both from entering Yemen and from accessing areas within the country, while relief efforts have faced shortfalls in funding amounting to hundreds of millions of dollars.2 A lesser known factor affecting the humanitarian response, and one that grew in severity as the war dragged on, was the increasing disparity between the official exchange rate and the parallel market exchange rate of the Yemeni rial (YR) against major world currencies, primarily the United States dollar (USD). Even as the value of the rial depreciated on the market, however, Sana’a Center consultations with UN agencies and INGOs suggest that most continued to exchange foreign currency for rials at the official exchange rate of 250 rials to the USD, given their reluctance to carry out large-scale transactions outside the official financial system. The banks themselves, meanwhile, largely switched to conducting daily transactions at the market exchange rate by mid-2016. The banks had a strong incentive to keep the humanitarian organizations exchanging currency at the official rate, however, given that by then reselling this foreign currency at the parallel market rate the banks profited significantly. Sana’a Center financial sources indicate that one particular Yemeni bank, which is a major money exchanger for humanitarian organizations, profited by almost $80 million between January and August 2017 through currency arbitrage. 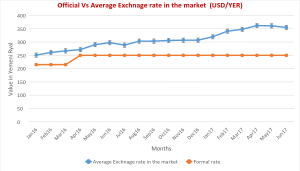 Prior to the beginning of the current conflict there was effectively no parallel exchange market for the rial, with the Central Bank of Yemen (CBY) holding the domestic currency at YR 214.9 to the USD using a managed float system. This became increasingly more difficult for the CBY to maintain, however, as the conflict gained momentum. Houthi fighters and the allied forces of former President Ali Abdullah Saleh overtook the capital, Sana’a, in September 2014, eventually leading to a Saudi-led military coalition intervention in March 2015; these events led to the suspension of Yemen’s oil exports – cutting the CBY off from its primary source of new foreign currency reserves – and sent the country into a precipitous general economic collapse. Since then, downward pressure on the rial’s value has mounted while the CBY’s capacity for monetary intervention has eroded as its foreign currency reserves have been depleted. By July 2017, the rial reached YR 367 to the USD in parallel market trading, a value some 47 percent lower than the official exchange rate and representing a total loss of some 70 percent in value since the conflict began. Given that humanitarian organizations were still using the official exchange rate, however, each dollar they sold at Yemeni banks was buying only 68 percent of the rials it could have purchased on the parallel markets, with the difference in value being pocketed by the banks. In 2017, the Food Security and Agriculture Cluster in Yemen – made up of UN agencies and national and international NGOs – calculated the price of a monthly food basket for the averaged Yemeni family at YR 24,000, including a 10 percent contingency.6 This food basket calculation has since acted as the standard humanitarian organizations use in delivering cash transfers to beneficiaries. Using the official exchange rate of YR 250 to the USD, this standard food basket would cost $96; at the July 2017 market exchange rate (YR 367/USD) the basket costs just $65.40. The UN’s Food Security and Agriculture Cluster planned to assist some 3.9 million beneficiaries between January and April 2017, with the total number that received cash transfers unavailable as of this writing. For the sake of demonstrating the potential impact of the differing exchange rates, however, the authors will assume that 1.9 million beneficiaries received cash transfers using the official exchange rate; had the aid agencies’ foreign funds instead been exchanged at the market rate, the same amount could have reached almost 2.8 million people. Sana’a Center research has also found that the profits accumulated by Yemeni banks through currency arbitrage have been used primarily for wealth accumulation, and have not in any significant capacity been utilized to support the importation of essential food supplies. On August 14, the CBY in Aden issued a circular stating that it would float the value of the rial, with the official exchange rate to be set according to the rate in the market. Sana’a Center financial sources report there had been significant pressure from the World Bank on the CBY in this regards, and that negotiations had also been underway for several months between UNICEF and banks in Sana’a regarding the exchange rate, in preparation for the arrival of almost $400 million in new humanitarian aid funding. These funds – provided by the World Bank to UNICEF and the United Nations Development Program (UNDP) – are intended to initiate cash-for-work programs and reactivate Yemen’s Social Welfare Fund (SWF). The SWF had been the primary state mechanism for aiding the poorest segments of the population until the lack of funding forced it to cease operations in December 2014. Distribution of the first $50 million installment of the new UNICEF and UNDP funds began on August 21. With this money exchanged at the market rate, it is estimated it will reach 1.5 million beneficiaries in six Yemeni governorates. The Houthi authorities controlling the country’s north have claimed that they do not recognize the authority of the new CBY governor in Aden and have refused to adopt the floating currency. As of the end of August the Houthis were continuing to charge tariffs on imported goods – coming mainly through the port of Hudaydah on the country’s northwest coast – at the rate of YR 250 to the USD. The previous official exchange rate of YR 250 to the USD was certainly unhealthy vis-à-vis the market exchange rate. A fully floating currency, however, is optimal for neither currency stability nor humanitarian aid purposes. Given that the CBY is effectively divided between Sana’a and Aden, and lacks foreign currency reserves, its ability to monitor and intervene in the exchange market is severely limited. Given the thinness of the market and the potential for volatility on a day-to-day basis when large transactions occur, fully floating the rial risks its rapid devaluation – a critical issue in a country that imports the vast majority of its basic nutritional needs. The Sana’a Center recommends a dedicated exchange rate for humanitarian funds calculated using a moving average of the market rate of the previous three months. Given size of foreign aid funds entering Yemen, the use of such an exchange rate would help stabilize the domestic currency and the price of imports on the local market, as well as provide humanitarian organizations with a fair price for their foreign currency and curtail excessive arbitrage. If at any time the aid rate and the market rate differed by more than 10 percent, there would be a re-evaluation of the aid rate to reduce that difference to less than 10 percent. The CBY and humanitarian actors – for instance, through the Inter Cluster Coordination Mechanism – should develop monitoring and reporting mechanisms. For better transparency, the daily market and aid exchange rates should be declared and reported throughout the humanitarian clusters, with exchanges of humanitarian aid funds reported to the central bank. Furthermore, the Sana’a Center recommends increased coordination between the CBY and local banks to ensure that aid organizations’ foreign funds entering Yemen are then used to support the importation of essential goods. This report was prepared by Mohammed Hasan, Ali al-Azaki, Anwar Anaam, Mansour Rageh and Spencer Osberg. 1 Food and Agriculture Organization of the United Nations, Yemen’s suffering is the world’s largest humanitarian crisis today, February 15, 2017; Since July 2015, The UN has designated Yemen a ‘Level 3’ humanitarian emergency, the UN’s highest level of severity and in the same category as Syria, Iraq and South Sudan. In July 2017 the UN Office for the Coordination of Humanitarian Affairs (OCHA) announced that the number of Yemenis in need of some form of humanitarian assistance or protection had risen to 20.7 million, from 18.8 million in January this year; of these 17 million people were classified as food insecure, including 6.8 million who are severely food insecure, while 8 million faced acute shortages of clean water and sanitation. This is largely due to the economic collapse, rampant unemployment and destitution that has taken hold in Yemen since the conflict began. The World Bank estimates the between 2014 and 2016 Yemen’s gross domestic product contracted 37 percent. A severe public sector cash liquidity crisis has led to most of the country’s roughly 1.2 million civil servants – supporting families totalling some 7 million people – having not received a salary since September 2016. The subsequent breakdown of public services – such as healthcare, water, sewage, and garbage collection – has been directly associated with this year’s cholera epidemic: at the end of May 2017 the World Health Organization (WHO) was reporting 35,000 cases suspected cases of cholera; by mid-August that number has risen to more than half a million, with some 2,000 associated death, and an average of more than 5,000 new cases being reported per day. The WHO also reported this year that some 14.8 million people are without access to basic healthcare. 2 The UN’s 2016 humanitarian appeal for Yemen of $1.63 billion was only 60 percent funded; this shortfall was rolled over into 2017. The UN’s updated appeal for 2017 of $2.3 billion was only 41.7 percent funded as of the beginning of September. 3 While response modalities vary based on the type of the crisis and the context, most donors and humanitarian agencies now consider cash programming an appropriate part of the emergency response. If the local markets are functional, the target group receives the assistance in the form of cash delivered physically, by charge cards or through mobile phone, allowing recipients to make their own purchase choices based on their personal needs. In addition, studies have shown that cash transfers can have positive multiplier effects for local economies, assisting small vendors and the market as a whole to keep running or re-established, while specifically in Yemen anecdotal suggests it has also strengthen local credit systems and community-level resilience. The Cash and Market Working Group (CMWG) reported that in 2016 cash and/or vouchers were distributed by 30 agencies in 13 of Yemen’s 22 governorates, with The Food Security and Agriculture cluster having the largest cash/voucher programme. 4 The local financial service providers delivering the INGO cash transfers include: the Yemen Post Office; microfinance banks Al-Kureimi and Al-Amal, the money exchange providers Al-Barq and Al-Herdy, as well as the Altadamon International Islamic Bank through the Mahfadti E-wallet program. 6 The average Yemeni household has seven members.